The gorgeous châteaux that line the mighty River Loire are a major attraction in the summer. But happily, many stay open in the winter as well. And in winter, you have the rooms to yourselves so you really feel the ghosts of the great figures of the past walking beside you through the echoing, empty rooms. The parks and gardens might be less colorful than in the summer months, but you can see the shapes of the flower beds, the gentle slopes and the trees. Here are five of the most magnificent properties that remain open year-round. The French Kings’ Château of Amboise sits on the western end of the Loire, between Tours and Blois. With fully furnished royal apartments and a history that goes back to Charles VIII in the 15th century, there’s plenty to see. The chateau dominates the town and the river and has a magnificent view over the Loire. 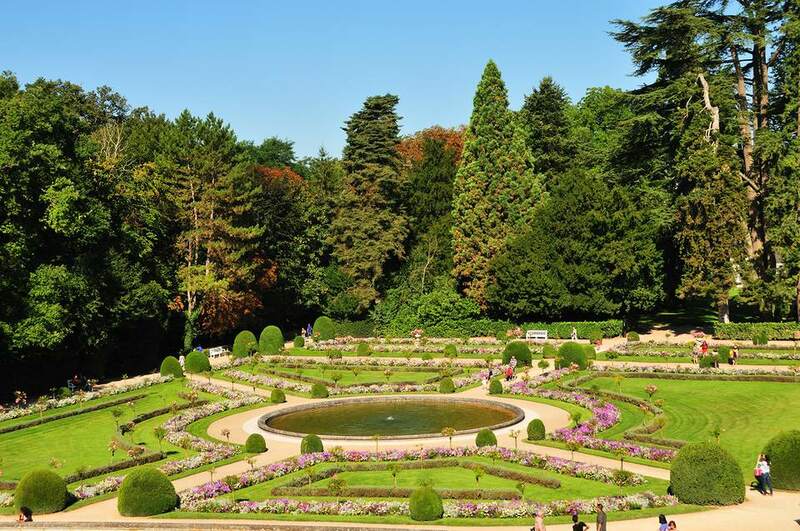 As a bonus, Leonardo da Vinci spent the last three years of his life at the nearby Chateau du Clos-Luce, where you’ll see manicured gardens and 40 models of his magnificent machines. He is buried in the Chateau’s Chapel St-Hubert. Chaumont lies between Amboise and Blois. It’s essentially a medieval castle that was much embellished during the Renaissance, and its interest lies as much in the rivalry between two extremely powerful women as in the furnished apartments. Catherine de Medici, widow of Henry II, forced her rival in the late King’s affections, Diane de Poitiers, to give up her château of Chenonceau (more on that below) in exchange for Chaumont, which was less spectacular. Chaumont became a cultural center in 2008 and has been transformed by an installation of stained glass panels in 2011. Chaumont is known particularly for its spectacular International Garden Festival which takes place each year from April to October/November. Blois is one of the grandest of the Loire châteaux, standing high above the town. It was originally just a medieval castle defending the area until Francois I decided to move here in 1503 from Amboise. Since then, seven kings and 10 queens of France have lived here. Blois is a visual lesson in the development of secular architecture in France from feudal times to Louis XIII in the 17th century. Part brick, part stone, the buildings include triumphal arch doorways, Italianate decoration, Gothic pillars, and wonderful ornamentation. It’s full of intrigue as well, thanks to Catherine de Medici’s study with its secret cupboards and Henry III’s apartments where Henri, Duc de Guise was murdered. François, I was unhappy with the old royal palace at Blois, despite the improvements he himself had made in the 1500s. So he drew up plans for a new, spectacular building in full-blown Renaissance style. It is a great building, some of it allegedly designed by Leonardo da Vinci. The double staircase points to a creative mind with its interlocking spirals opening onto internal loggias. But François I did not get to enjoy the chateau with its richly furnished state rooms or the glorious viewpoints from the pepperpot roofs that he had commissioned. Defeated in battle in 1525, he returned to France to live closer to Paris and spent his last years at Fontainebleau and St-Germain-en-Laye. Unlike many of the Loire’s great châteaux, Cheverny is still in the same family that built it in 1634. The owner’s hunting dogs are kept on the estate, so if you’re lucky you might see the pack setting out for a day’s hunt, complete with green-coated riders trotting behind. Cheverny is gloriously symmetrical with a central façade flanked by square pavilions. Walk up the main wide stone staircase and you enter a decorated world of elegance and luxury: tapestries on the walls, painted wooden ceilings, ornate gilded fireplaces, Old Master paintings, portraits, over-stuffed chairs, ornate cabinets by Boulle so beloved by Louis XIV, half tester and four poster beds covered in red and gold silk, and armor on the walls. Built across the river Cher, Chenonceau is an extraordinary property. It's known as the Ladies’ Château, occupied by the Dames de Chenonceau. Originally built by Katherine Briçonnet, its history really began when Henri II purchased it in 1547 for his mistress, Diane de Poitiers. When Henri died in 1559 in a jousting tournament, his wife and arch-rival of Diane, Catherine de Medici, forced Diane to exchange her beloved Chenonceau for Chaumont. Catherine got to work on the château, in particular building the two-story gallery on the bridge which recalls the bridges in her native Florence, Italy. Inside, Chenonceau is decked with Gobelin tapestries and paintings by masters like Poussin and Rubens adorning the room of Five Queens, the apartment of Louis XIV, the grand gallery overlooking the River Cher and the Green Cabinet of Catherine de Medici and the kitchens. At Christmas, Chenonceau is magical with huge Christmas trees in the gallery overlooking the Cher and tables laid for a banquet in the kitchens.